This amazing portrait was created by Ashley Nye......Ashley specialises in bespoke baby, children and family portraits.using photographic images of your loved ones to create this amazing art design portrait. 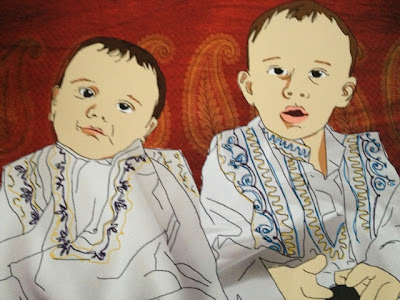 I choose a special picture of my boys when they were babies and emailed Ashley, a very simple process as we didn't have to sit still or be somewhere and we could step back in time and recreate a portrait of one of our all time favourite images... I was very excited at the prospect of receiving the portrait of my children. Ashley has worked wonders and has enhanced the fine details within the image and has caught the mood perfectly within facial expressions and emotions the details of clothing and the throw on the sofa in which they sit on are amazingly captured within the art....An amazing piece of art and awesome portrait. If you would like to know more about Nye Portraits then visit and take a look...a perfect gift for the home or someone special. I received an A5 portrait for purpose of this review...All thought are that i my own and i remain honest in my views and opinions.